November is approaching rapidly, as is December, the holiday season and the end of 2018 as we know it. There are many important dates coming up in that impending year-end window, including the dates listed in this very post, on which many much-anticipated movies and shows make their way to the big ‘Flix. But there’s no more important date on the horizon than Nov. 6, so before you dive into any of the info below, spend five minutes on Vote.org and do your civic duty. It’s a much bigger deal than any of the below. 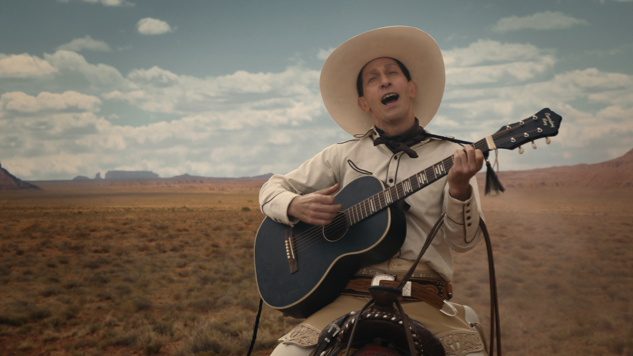 The fate of the United States notwithstanding, Netflix’s incoming feature film and television slates are typically eye-popping, and the service’s arguable most exciting addition falls somewhere in between: The Coen Brothers’ The Ballad of Buster Scruggs (Nov. 16), the four-time Oscar-winning directorial duo’s Netflix debut, began its life as a miniseries before being snapped up by Netflix and repackaged into a feature film. The six-part, frontier-set Western anthology comprises a series of distinct tales of the American West, told as only the incomparable Coens can. Threatening to steal Buster’s thunder, though, is a piece of film history in The Other Side of the Wind (Nov. 2), the long-lost final film from Hollywood legend Orson Welles. Starring John Huston, Peter Bogdanovich, Susan Strasberg and Welles’s partner Oja Kodar, The Other Side of the Wind is a film-industry satire that follows famed filmmaker J.J. “Jake” Hannaford (Huston), who returns to Hollywood after years in self-exile in Europe with plans to complete work on his own innovative comeback movie. Those are merely the crown jewels atop Netflix’s long list of incoming films, which also includes Francis Ford Coppola’s mixed bag of a vampire epic Bram Stoker’s Dracula , Martin Scorsese’s Oscar-nominated 1991 crime-thriller Cape Fear, Alfonso Cuarón’s dystopian thriller Children of Men, Steven Spielberg’s Oscar-winning sci-fi classic Close Encounters of the Third Kind, franchise-seeding found-footage disaster thriller Cloverfield, Matt Damon- and Ben Affleck-penned drama Good Will Hunting, iconic college comedy National Lampoon’s Animal House, John Hughes’ coming-of-age romantic-comedy Sixteen Candles and Oscar-dominating WWII epic The English Patient, among others. And those are just the movies debuting on the first of the month—following are Welles documentary They’ll Love Me When I’m Dead (Nov. 2), 2007 Pirates franchise entry Disney’s Pirates of the Caribbean: At World’s End (Nov. 4), Netflix’s David Mackenzie-directed (Hell or High Water) historical war epic Outlaw King (Nov. 9), Jeremy Saulnier’s relentless thriller Green Room (Nov. 12), Emmy-nominated Pixar documentary The Pixar Story (Nov. 18), beloved sushi chef documentary Jiro Dreams of Sushi (Nov. 22) and A Christmas Prince: The Royal Wedding (Nov. 30), the sequel to last year’s delightfully bad holiday romance du jour, A Christmas Prince. On the TV side of things, Netflix isn’t exactly slacking: There are numerous big-deal titles headed to the streamer in November, most notably the sixth and final season of one of Netflix’s oldest and most successful original shows: House of Cards (Nov. 2). The dark political drama nearly came crashing down after the sexual misconduct allegations leveled against former star Kevin Spacey, but Netflix ultimately found a way forward for the show’s conclusion, killing off Spacey’s character and shifting focus to Robin Wright’s Claire Underwood for what we can only hope is a satisfying final eight-episode run. Following House of Cards’ early-November debut are a number of other noteworthy additions, including new episodes of weekly comedy series Patriot Act with Hasan Minhaj (Nov. 4), Narcos’ new-look fourth season Narcos: Mexico (Nov. 16), Trevor Noah’s latest stand-up special Trevor Noah: Son of Patricia (Nov. 20), new MST3K season Mystery Science Theater 3000: The Gauntlet (Nov. 22), roast-heavy comedy special Bumping Mics with Jeff Ross & Dave Attell (Nov. 27) and season three of Bill Burr’s Emmy-nominated animated comedy series F Is for Family (Nov. 30). Last and most upsetting is everything leaving Netflix next month. Amelie, Jurassic Park, The Reader and Up in the Air disappear from the streamer’s library on Nov. 1, followed by Paddington on Nov. 16, so make sure to carve out some time for these titles while you can. Check out Netflix’s complete November slate below, beneath the streamer’s sizzle reel.